Who doesn’t love seeing the golden glow of aspen leaves (Populus tremuloides) dancing in the breeze on a mountain hillside? Many gardeners living at Colorado’s lower elevations have been smitten by the quaking leaves of aspen trees and tried to bring some of that mountain magic into their own yard. But doing so reveals lessons in plant ecology, and reminds us that not every plant we want to have in our home landscapes can easily grow there. Aspens are a “succession” tree, moving into areas where other trees and shrubs were removed by logging, fire, erosion, insects or disease. As a succession species, they are not long lived. Their presence helps lead the way to other longer living trees. In addition, aspens are highly susceptible to insect damages and diseases. Aspens that were collected in the wild are even more prone to damage and disease, as their root system is either injured or is incomplete during collection. Nursery grown aspens are generally healthier than collected ones, but still will likely succumb to problems and a shortened life. Most arborists and horticulturists advise against planting Aspens along the Colorado’s Front Range. The growing conditions of the Front Range are different than those areas where Aspen thrive naturally. Aspens like to grow in gravelly, moist but well-drained soil with a lower pH (more acidic) that can typically be found at higher elevations. Along Colorado’s Front Range, our soils are typically heavy clay soils that don’t drain well and have a higher pH (more alkaline). Summer weather along the Front Range is hotter and drier than in the mountains, another factor going against the health of Aspens planted east of the high country. If you really must have the quaking leaves of aspen in your yard, only plant them if you can place them in the north or east sides of your home (due to the afternoon heat of south and west exposures) and only if it is a nursery grown tree. Keep them away from objects that might radiate too much heat to the trees such as paving. Amend the soil with organic matter in an attempt to increase the acidity of the soil, and then mulch the newly planted tree well. You might also consider adding gravel or perlite to the soil before you plant to improve drainage, and reduce the problem of heavy clay soil. Even if you can adhere to the aforementioned criteria while planting your aspen, it’s not likely your tree will achieve the brilliant gold of the aspens at higher elevations due to differences in soil chemistry, soil texture, soil moisture, day and night temperatures, and sunlight discrepancies at the different elevations. In addition you should be on the lookout for several different diseases and insects that more readily afflict aspens planted out of their native range. 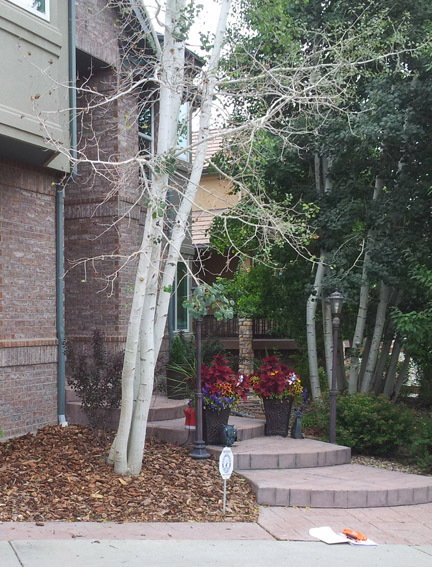 Furthermore, if you want to remove aspen trees that are established in your yard, you may get many suckers (the stems that sprout up from aspen roots) coming up in your yard for many months after you removed the main trunk. So in my opinion, no, aspen trees should not be planted in the Denver area, because it is not likely they will do well. But if you are aware of the many shortcomings of aspens planted outside of their native range, feel free to give them a try. Thank you, Todd, for an informative overview. I particularly appreciate the explanation for the lack of vibrant colors. Something to add: my understanding is that Aspens do best in moist soils. Thus, the choice of Aspens increases summer watering requirements.